I went last night with my colleagues for this movie starring Govinda and Salman Khan. I was sceptical as usual before watching any Govinda starrer, neither am i a fan of Salman. So why did I go? Maybe because most of my friends who had watched this earlier had given me a good review and maybe because i had nothing else to do. This movie is totally lifted from the Will Smith starrer, Hitch, released in 2005. 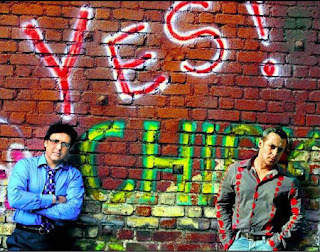 Scene for Scene the antics have been copied and Govinda has done quite well adding a few of his own twists and gaffes. As usual there are scenes from other hollywood movies too that have been taken to-to, like Jerry Mcguire. Salman Khan plays the role that Will smith played in Hitch, and Govinda is the guy who needs help in setting up a date with Katrina Kaif. Lara Dutta plays Salman’s love interest. Watch out for Rajpal Yadav as Chotta don… wow this guy is amazing in a small freakish role. In the film he aspires to look like Shah Rukh Khan and dresses up in a dapper black coat and glares just like Shah Rukh in ‘Don’. And sports dialogues in Amitabh’s deep voice. The characters are not well developed and the film could have been edited better. But if you are looking to escape the stress and strains of daily life then this is the movie for you. The music though is not that good, but Govinda’s dancing makes up for it. Govinda certainly has turned a corner. He does confident parodies of his old collaborations with David Dhawan, takes ghoulish delight in tormenting his screen-buddy by his antics and has himself a whale of time…in and out of the sky-blue waters. I do not laugh much, but last night had a good laugh after along time.